The pictorial directory is an alphabetic listing of families and members in your organization. This online resource enables you to put names with faces and obtain a family or member's email address, telephone number, and address. The Pictorial Directory is available only if your church enables the feature. The pictorial directory is a ministry tool that helps members of your church get to know one another better by putting names, faces, and contact information together. The directory is available only if your church enables the feature. Key elements of the directory are identified in the callout links in the illustration below. Place your mouse pointer over a link (without clicking) to view a brief description of the element. For a more detailed description, click the callout link to jump to an explanation later in this topic. The organization associated with your ParishSOFT login credentials automatically appears in the Organization list, which is located in the upper-right corner of the page. If you manage more than one organization, the organization you want to work in from the list. ● To find a specific member or family, type the last name, first name, or both names in the fields. Click Clear Filter to clear the filter setting and return to the complete directory listing. 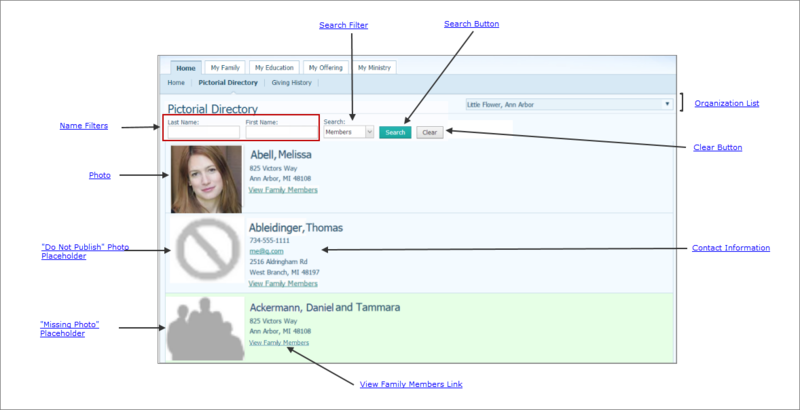 The Search filter enables you to focus your search on member or family directory listings. Select Member or Families from the list. 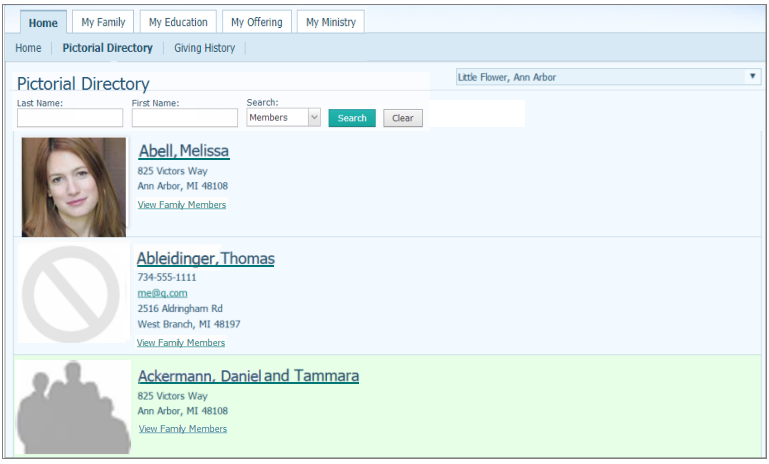 Searches the directory for the family or member that matches your name search criteria. Clears search criteria from the Name filters. The entries in the directory appear in alphabetic order by member and family last name. For instructions on locating a specific member or family, see How to Search the Pictorial Directory. The Publish Photo option in the family record controls permission to publish a photo (for details, see Options_to_Publish_Personal_Information). If the member or family gives permission for a photo to be published, it appears next to the left of the member's or family's name. ● for a missing family photo. ● for a missing member photo. If the family or member does not give permission for a photo to be published, this symbol is displayed: . A member's telephone number, email address, address appear in the directory only if the respective options to publish this information are checked in the family's profile (Family Details). To view option descriptions, see Options_to_Publish_Personal_Information. If a photo or contact information is not displayed, the member or family selected not to publish this information in the directory. The options to publish personal information are set in Family Details. To view option descriptions, see entries in this table: Options_to_Publish_Personal_Information). To view the names of individual family members, member photos (if available), and contact information (if available), click the View Family Members link.